The end of an era and the dawn of another. 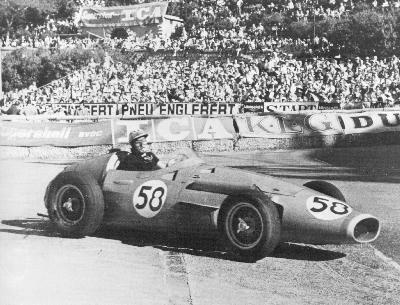 The 1958 French GP wasn't just 'Juan Manuel Fangio's last race'. The world of F1 was changing very rapidly in the late fifties and the Maestro, at the age of 47, must have felt he was part of the old state of affairs. After Fangio's retirement the 250F was still raced but now thoroughly outdated. 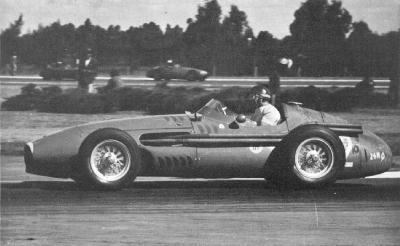 Since that day in early 1955, the image of a 'proper' Grand Prix car, in my mind at least, has been the Maserati 250F. It just looked right from Day One and just got better looking, hitting its peak in 1957 when the works cars just looked fabulous in the new bodywork and that lovely shade of Italian racing red. The 250F wasn't the most successful GP machine of even its day, nor the most technologically advanced, but it was a good idea executed extremely well. In many ways it was the backbone of the early years of the formula. Mercedes and Lancia came and went, Ferrari was there in various guises, there was the seemingly eternal 250F out there on the grid somewhere until the changing tide finally caught up with them in 1959. The 250F was present at the first race of the 2500cc formula, Argentina 1954, and was also there at the last race of the formula, the 1960 United States GP. Few cars have had such longevity in racing, only the Lotus 72 being in the same select group of great cars. The 250F was also the machine that created the 'Cult of the Chassis Numbers.' Although specialists such as Denis Jenkinson (and there was also a wonderful book lost in the shifting sands of time entitled Case History which traced the history of certain particular and historic cars, and the author's name I simply cannot recall) had been recording such information for years, much more from a technical interest than a historical one, it was the 250F that made matching up chassis numbers and race results the manic obsession it is today. Why? 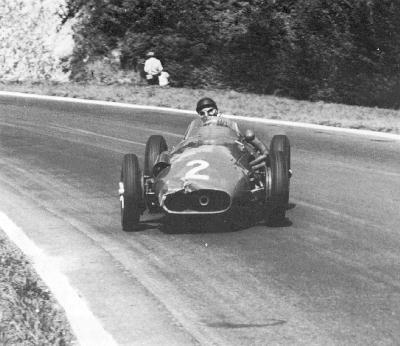 Because at one time no less than three to five (accounts vary) museums claimed to have the very 250F Fangio used to drive to his best - and last - victory at the Nürburgring in 1957. And then came historic racing and the verification of the identities of the cars that competed. Remember that back in those days racing cars were simply tools and when of no further use, disposed of somewhere in the outer reaches of the racing world. Only a few, the 250F as an example, really even had a type number of designation readily identifiable. Coopers were just, well, Coopers. There were various 'marks' but few had any real interest in that sort of thing. Since my first encounter with them, I have always had a soft spot for Maserati racing cars. Just one of those indefinable attractions to red, Italian racing cars. The great voiturette racing cars of the 1930s - the 4CM, 6 CM, 4 CM/1500, and 4 CL - were in some of the books I owned as a child. I thought that they were absolutely fabulous. So, at a very early age I was a big Maserati fan. But, what about Maserati? Who were those guys, anyway? Until 1938, the Maserati Brothers – Alfieri, Bindo, Ettore, and Ernesto – ran a wonderful little racing car factory in Bologna. The family business had been spark plugs, but one thing lead to another and in 1926, led by Alfieri, they started tinkering with building their own racing machines. Unfortunately, in 1932 Alfieri died from the lingering complications of an accident in 1927. Ernesto took control of the company, but as things were to prove, even passion has its limits. In 1938, after producing a series of increasingly successful monoposto designs for Grand Prix and voiturette racing, the Maserati brothers sold out to Commendatore Adolfo Orsi. Orsi did two things almost immediately. First, he appointed his son Omero as the Managing Director of the company. Second, he moved Officine Alfieri Maserati SpA from Bologna to its new address, Viale Ciro Menotti in Modena. It is from this address that would see the likes of one of the classic racing cars of modern racing emerge: the duecento cinquanta effe, the 250F, the Classic in Red. The 250F was intended to be a 'customer' car. Supplying such cars a talent that the factory had honed to a fine edge during the 1930s and into the early 1950s. The works effort for 1954 was primarily supported with outside sources doing much of the funding and expanded as the season progressed. Under this arrangement it was not unusual for customer cars to be entered under the name of the works team. This meant that things do get a tad confusing at times with customers retaining their cars, but entered by the works. In 1955, the factory fielded a true works team. 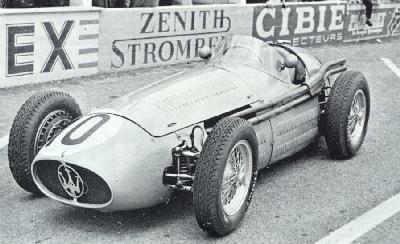 It was led by Jean Behra, but the onslaught of the Mercedes team made podium results a distinct challenge. 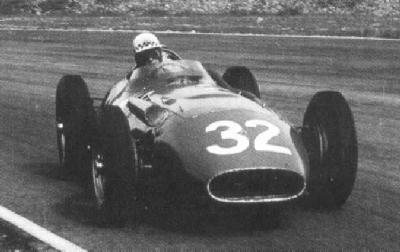 In 1956, Stirling returned to Maserati to join Behra. In a toe-to-toe battle with Scuderia Ferrari, Officine Alfieri Maserati came up just short in both the Grand Prix and sports car worlds. However, it gave Ferrari all it could handle. 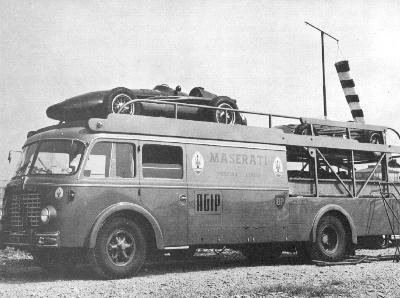 There were, however, already danger signs of economic problems with Maserati, but the Orsi family managed to cope. 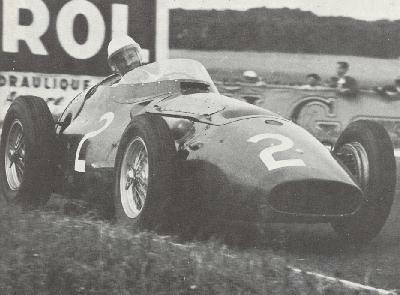 For 1957, Juan Fangio returned to lead Maserati into Canaan. The effort was fruitful and Fangio captured his fith - and last - World Championship. The team was composed of Fangio, Behra, and Harry Schell, with other drivers at various venues. But, the costs were mounting and it was obvious that the racing program was in trouble. 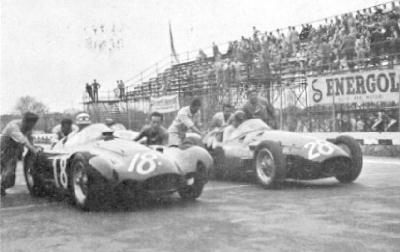 Even so, the works entered a team for the 250F cars until the end of the 1957 season. By then various and assorted financial ills of both the factory and on a national scale, had forced Maserati to the brink of bankruptcy. Drastic measures were instituted and funding slashed for the racing team towards the end of the season. Some creditors were willing to either forgive or reduce debts if Maserati captured both the Drivers' Championship and the Sports Car Championship for the year. With Fangio, they won the Drivers' Championship, but a disasterous race in Venezuela - where all the works cars were eliminated in accidents, one involving two of the team's cars - Ferrari carried the day and the factory finally closed the doors to its racing shop. It remained open, but only to service customer cars and credit was a thing of the past. Despite this, the factory did manage to keep its fingers in the racing game, but only through its customers. Maserati now produced racing cars strictly on a commercial - if that term can be applied - basis. The Tipo 60 and 61 'Birdcage' sports racing cars are an excellent example of that approach. There was a legacy of the lingered in Grand Prix racing for nearly a decade after the last 250F appeared: the V-12 that was used briefly during the 1957 season. In 1966, a revised version of the engine was used to power the Coopers that ran under the new 3-litre formula. A Maserati name made its last appearance on a Grand Prix grid at Monte Carlo in 1969 when the Cooper of Vic Elford, appropriately entered by Colin Crabbe's Antiques Automobiles team, took the starter's flag. My hat is off to the 8W Team for even entertaining such a project, much less giving it their wholehearted support for this magnum opus. Before you look at the 250F, you have to examine its immediate predecessor, the A6GCM. It was the product of Alberto Massimino and Antonio Bellentani. It was their misfortune to have to compete against the Ferrari 500, one of the most successful designs of its day or any day. Keep in mind that when the A6GCM was being sketched out on the design table, that the Grand Prix races of the coming season were still being targeted against the Formula 1 regulations. The change by the organizers to the use of Formula 2 as the primary formula was still in the future. The Maserati 4CLT series had run its course in F1 and the Modena factory was looking to use F2 as a means of getting back into the game, so to speak. Although a good basic design, the A6GCM only won one World Championship event, the 1953 Gran Premio d’Italia at Monza with Juan Fangio at the wheel. It was also the first such win for Maserati. And it convinced the factory to reconsider it original decision to only produce cars for clienti (customers) in the future. 5.25 x 16 front; 6.50 x 16 rear. Interestingly enough, where there is no difficulty on pinpointing those directly responsible for the design of the A6GCM, the 250/F1 was actually a team effort. The original concept was laid out by Gioacchino Colombo with Luigi Bellentani and Alberto Massimino, borrowing from the experience gathered from the A6GCM and observation of other contemporary monoposto designs (primarily Ferrari). 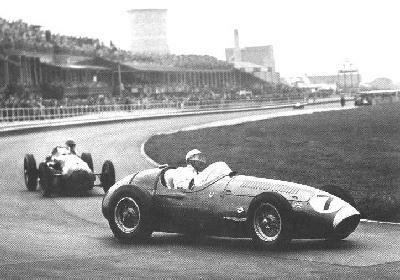 However, all three departed Officine Alfieri Maserati for Scuderia Ferrari in late 1954. This left Giulio Alfieri as the head of the technical staff, to which he was appointed as director in May 1955. The 250/F1 was initially intended as a customer car series, but when the opportunity arose to once again field a works team, the Officine couldn’t resist. That Juan Fangio would be available until the reappearance of Mercedes did not hurt. However, there exists reasonable evidence that there were - perhaps - two additional 'A6GCM/250' which were used: 2032 and 2051. The factory always admitted to a sixth A6GCM/250, probably '2051,' since the use of '2032' seems to be strictly a one-off sort of affair. But, the sixth car was never officially designated by the factory and the experts have had a field day ever since then. This chassis logbook covers the A6GCM/250, 250/F1, and 250F series chassis numbers in races run under the 1954-1960 Formula 1 regulations for Grand Prix cars. Any attempt to cover the Formula Libre and other races would have made an already messy project next to hopeless. This is generally, more-or-less, kinda, sorta accurate, but since all the factory machines and many of the customer cars were prepared in the same place, it gets ugly fast and early. The works was not above "borrowing" a customer car, doctoring the paperwork – to say nothing of the chassis number plate! – and using it if necessary, with the customer not often being notified of such uses of his machine. It is doubtful that we will ever be 100% sure, but then again, the factory rarely worried about that aspect of the business. The format is thus: Year/ Month/ Day Driver(s) (Entrant), race number, event (‘GP’ for Grand Prix, Grosser Preis, Gran Premio, etc. )/ circuit, result. Here and there you will find red and blue text which was a means of drawing my attention to 'problem' areas or to point out some anomaly that was either confusing or amusing - and usually both! There is no "code" for why I used the red or the blue, it was whatever struck me as appropriate at the time. The logbook starts with the 'Iterim' cars, the so-called 'A6GCM/250' cars and then goes through the chassis in numerical order. Each chassis will have some remarks on its history and most will have a picture of it at some point in its racing life as well. As for those chassis with multiple personalities, well, the 8W Team did its best. And there will be errors. In any project of this size and complexity, that is inevitable. Some will be of omission and others due to poor typing skills and the general level of chaos and confusion which surrounded this effort. 2032 – This the first A6GCM chassis and was delivered to Escuderia Bandeirantes in 1951. As indicated, it is now thought that perhaps 2032 did not race with a 250F engine, but given the situation and some of the chaos and confusion that surrounds some of the early efforts of the Officine and its attempts to keep the customers happy, anything is possible. After considerable thought, I am inclined to think that 2032 probably used an A6G engine. However, I decided to include it here just in case. 2038 (’2510’) – This A6GCM was one of the 1952 works cars. It was sold to de Graffenried in 1953. It was then converted for use by Baron Emmanuel de Graffenried as an interim car, but was never replaced by a 250F chassis number. For a number of reasons, all of them related to funding, a replacement chassis was never built for '2510.' It is certain that 2038 raced in Buenos Aires, but it perhaps did so with an A6G 2-litre engine. 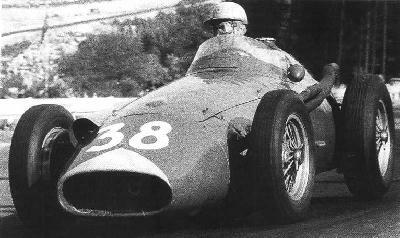 From Spa-Francorchamps onward, 2038 - alias '2510' - was equipped with a 250F engine. 2041 (’2503’) – This A6GCM was a 1952 works car. It was sold to Enrei Shell, Argentina, in 1953. It was obtained then by Harry Schell and then converted by the factory for his use during the 1954 season. While it was campaigned during the 1954 season, a replacement chassis using the number '2503' was never applied to a 250F/1 chassis. This was due to the funding never being found for a replacement chassis for the A6GCM/250 2041. It was later sold to Reg Hunt in Australia. 2044 (’2504’/’2502’) – This A6GCM was a 1953 works car. It was converted by the factory in 1954 for use by B.Bira until his pukka 250F was completed. When his 250F chassis was ready, the engine was removed and dropped into the new chassis, also numbered 2504. 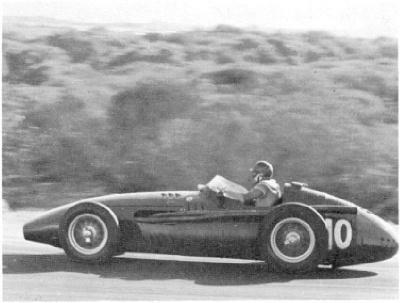 The A6GCM/250 interim 250F/1 chassis was then sold as a rolling chassis. However, it may have been the chassis for the Daponte A6GCM/250 since '2502' wasn't ready for Daponte. At any rate, A6GCM/250 chassis 2044 ended up with the identity '2502' along the way in the hands of Uria. 2046 (’2501’) – This A6GCM was a 1953 works car. It was converted by the factory for use by Roberto Mieres during the 1954 season. 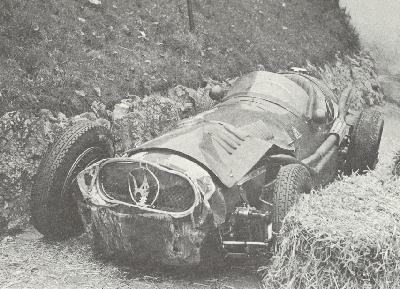 To say that 2046 had an eventful 1954 season is perhaps something of an understatement: at Bordeaux, it crashed; at Spa-Francorchamps, it burned; after Reims, it was heavily damaged in a road accident! The transporter hauling 2046 back to Modena managed to overturn as a result of the accident. The transporter was a two-decker and 2046 was on the top tier. It was damaged very extensively – broken into two big pieces! – and effectively written off. The chassis was discarded since a replacement chassis was almost ready anyway. This interim 250/F1 chassis number, ‘2501’ will be recycled by the factory for later use. 2048 (’2502’) – This A6GCM was a 1953 works car. It was converted by the factory for use by Jorge Daponte for the 1954 season. It was campaigned briefly in Europe and then accompanied Daponte to South America. As noted, originally thought to be powered by a 2.5-litre 250F engine, in reality 2048 was powered by an A6G 2-litre engine. However, one source states that '2502' was written off or heavily damaged in December 1953. Was it 2048 numbered as '2502' in its A6GCM/250 guise or the 250F '2502'? The contemporary reports of the race include 2048/'2502' among the cars using the new engine and the confusion has lasted from then onward. However, one source states that '2502' was written off in December 1953. 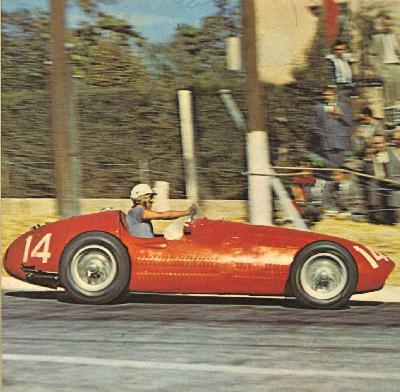 Therefore, if 2048 was replaced with 2044 for Daponte as '2502' and it raced without a 2.5-litre engine at Buenos Aires, then it really wasn't an interim car - an A6GCM/250 - and so shouldn't be in the chassis logbook, right? Maybe. Remember, we are dealing with Maserati here and nothing has to really make sense. 2051 – The last of the A6GCM series apparently was used in the Argentine races only. There is some reason - perhaps a lot - to believe that it was powered by a 2-litre A6G engine and not a 2.5-litre 250F engine in its first season. As the newest A6GCM chassis it would have seemed logical for 2051 to be used as an A6GCM/250, but sources disagree on whether or not it was actually ever powered by a 250F engine in 1954. 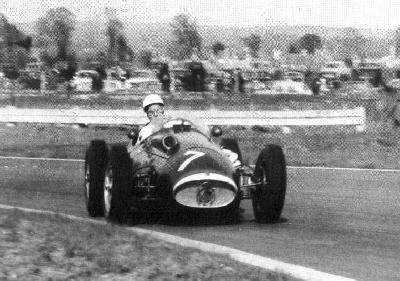 For the 1955 and 1956 races in Argentina, 2051 did have an 250F engine. However, it might be that the Daponte chassis written off may have been replaced with 2051. Therefore, it could be the former A6GCM/250 chassis thought to be numbered as 2044, but in reality 2051. One of those 'switched-at-birth' sort of things. Maserati did not believe in making things simple. This is one that always leaves me in a daze. 2501 (2523, 2524, 2526, 2046) – The chassis to bear 2501 was apparently built-up in October 1954 for the Paris Auto Salon, after chassis 2512 was completed. It was assigned the out-of-sequence chassis number of 2501 and served on the works team until 1957. 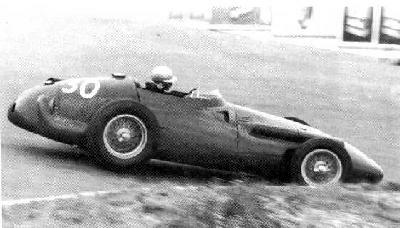 It is possible that the 250F with the chassis number '2501' originally was heavily damaged as a result of a crash during testing at Modena in December 1953 - there was a collision with another car on the track. The damage was fairly extensive and so either the chassis was scrapped or simply put off to the side until later on, which turned out to be after the Italian GP. It first appeared with the new riveted fuel tank and new bodywork without the louvres of the earlier cars. The chassis number '2501' was originally used for 'A6GCM/250' 2046. As related earlier, that chassis was effectively written off as a result of the road accident following the French Grand Prix at Reims. The use of chassis 2501 was primarily for component testing and experimental work by the factory team, such as fuel injection, engine ducting, and so on. Chassis 2501 was later renumbered as one of three, count 'em, three, chassis to carry the number '2523'. Also entered as '2526' for one race in 1957 and 2524 as 2501 in another race the same season. 2501 was rebodied in mid-1956. In 1958, 2501 became the third chassis to use the number 2523! It was the chassis used by de Filippis, not the V-12 2523 as formerly assumed, 2522. In 1960, 2501 was rebodied with the bodywork from 2509/2504 and renumbered as 2504 and sent to a customer in New Zealand - from whence it returned only to be renumbered as '2523' for historic racing. 2502 (2506, 2511, 2048) – Customer car for Mantovani delivered in May 1954. However, prior to the 'real' 2502 appearing, 2506 went to Argentina as 2502. 2506 carried the chassis number '2502' as a matter of convenience and to create confusion with the A6GCM, 2048, carrying the interim chassis number of '2502.' At the end of the 1954 season, 2502 dropped from sight. It was, however, retro-fitted with the new riveted rear tank before the end of the year. It was thought to be either discarded, used as the basis for another car, or for spares to repair another chassis. It was used, in fact, as the basis for chassis '2511'. It was obtained by Scuderia Centro Sud and retained for the 1955 through 1959 seasons. Chassis '2511' was rebodied before both the 1956 and 1957 seasons. It was sold to a customer in South America, raced using a Chevrolet engine, and has subsequently disappeared. 2503 (2041) – This chassis number was not allocated to a 250/F1 chassis, only to the converted A6GCM chassis, 2041. 2504 (2509, 2044) – This customer chassis was delivered in June 1954, to replace the converted A6GCM chassis, 2044, being used by B.Bira (Prince Birabongse Bhanutej Bhanubandh). The engine from 2044/'2504' was taken out and dropped into the new chassis. The chassis was damaged by Ron Flockhart while it was on loan to the Owen Organisation, the entrant for British Racing Motors, BRM. The Owen Organisation simply switched its chassis, 2509, for the damaged 2504. Therefore, the Bira 2504 was now actually the Owen Organisation chassis, 2509 (with all the modifications that the Owen Organisation had placed on 2509 removed), from the Caen race onward. The Bira car - 2509/2504 - was fitted with the new riveted reat tank in early 1955. Bira retired in 1955 and then sold the chassis to Horace Gould in 1955. In turn, Gould later sold it to Bruce Halford. Halford crashed it and returned it to the factory for a rebuild. A new chassis was built using the old number, 2504 - although it was actually chassis 2509, and then returned to Halford. The original chassis, 2509/'2504' was retained by the factory and eventually re-surfaced some years later. See the entry for 2509. In 1958, '2504' was rebodied in 'Piccolo' bodywork and initially confused with chassis 2532, 2533, and 2534 as a fourth 'Piccolo' car. 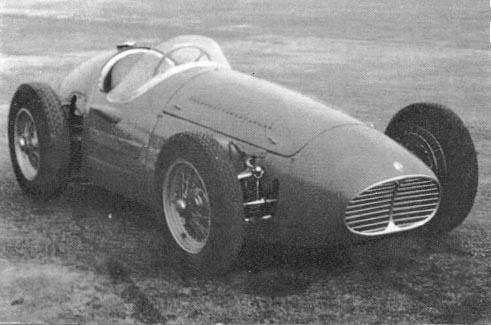 Several contemporary reports and others since then, recorded '2504' as the chassis Fangio used in his last race, in great part due to the new bodywork given '2504' during the re-build. 2505 (2500) – A works car built for the 1954 season opener in Argentina. It was retro-fitted with the new riveted rear tank before the end of the year. After service as a customer chassis, 2505 later returned to the factory shops in 1958. It was 'restored' and presented to the Biscaretti Museum in Torino in 1960 after being re-numbered as '2500.' This is the only chassis thought to have retained its original louvred bodywork throught out its entire lifespan. 2506 – A 1954 works car 'officially' delivered in June, but actually one of the cars sent to Argentina in 1954, carrying the number '2502'. Whatever the real reason was, it may have been just to ensure that a car with '2502' was in Argentina to facilitate the later importation of the Daponte chassis. It was subsequently sold to Louis Rosier at the end of the season and raced extensively by Equipe/Ecurie Rosier. It was retro-fitted with the new riveted rear tank before the end of 1954. 2506 was rebodied for the 1956 season. It was later renumbered as '2511' by Scuderia Centro Sud. There was one race entry of 2506/'2511' as '2522' in 1957, which created some scratching of heads later on when there seemed to be two chassis with the number '2522' in the paddock. No one ever said this was easy. 2507 (2507/2, 2523, 2522) – A 1954 customer car built for Sid Greene and his Gilby Engineering Company. Chassis 2507 was delivered in March 1954. 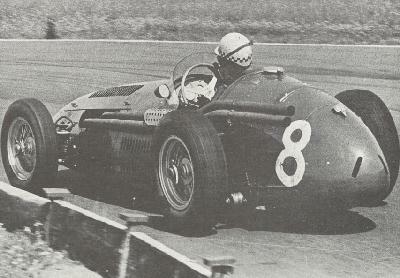 The primary driver for Greene and chassis 2507 was Roy Salvadori. After a crash at Oulton Park in August 1954, it hit a tree, the damaged chassis 2507 was returned to the factory. In Modena, a new chassis was built retaining the number '2507.' The new chassis was then returned to the UK, with the factory retaining the original chassis. The new '2507/2' was rebodied for the 1956 season. Chassis '2507/2' was later retired to a museum, but not before Ivor Bueb campaigned in it. The original 2507 chassis, which had been retained by the factory, later resurfaced for use as the basis for chassis '2523/1' which was later rebodied and renumbered as 2522 to Scuderia Centro Sud for 1957. It was rebodied again later during the 1957 season. The Scuderia used 2507 as one of its school cars for a period. In 1959 2507 (as 2522) was sold to a client in South America. It was later fitted with a Chevrolet engine. It returned to Europe in 1972. Easy isn't it? 2508 – A 1954 customer car for built for Alfred (A.E.) Moss, Stirling's father, and actually ordered through Shell-BP in Italy. 2508 was delivered in May 1954. It was also raced by Stirling Moss even after he joined the works team at the end of the 1954 season. Chassis 2508 had a unique pedal arrangement: rather than the typical clutch-throttle-brakes setup used in Italian monopostos, 2508 had its pedals in the order of clutch-brakes-throttle. The works used 2508 to test various experimental engines in 1954 until 2501 was ready. It was retro-fitted with the new riveted rear tank before the end of the year. 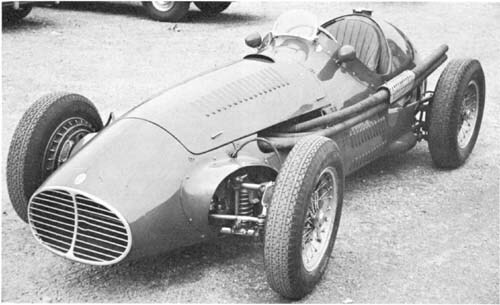 In 1955, chassis 2508 was retained by the Moss family and raced by a number of drivers. 2508 was rebodied for the 1956 season. At the end of 1956, 2508 was returned to the factory and was stored temporarily. Sold in 1957 to Ross Jensen of New Zealand. The chassis as re-numbered, for obscure paperwork reasons, as '2513' at that time. It returned to the UK and renumbered, correctly, as 2508. 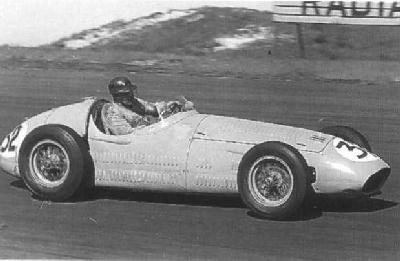 2509 (2504) – A 1954 customer car delievered in June for A.G. Owen (the Owen Racing Organisation), the entrant for British Racing Motors - BRM. It was extensively modified by BRM, using Dunlop wheels and disc brakes in place of the usual Borrano spokes and Maserati drum brakes. When Ron Flockhart crashed Bira's 2504 while it was being tested by BRM, the damaged chassis 2504 was replaced by chassis 2509 and returned to Bira. The BRM modifications were stripped from 2509 and then transferred to 2504. 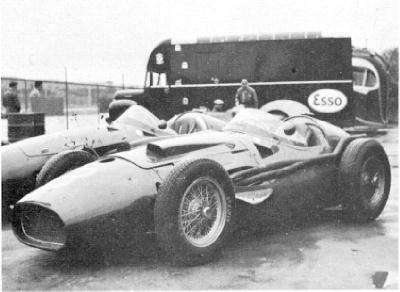 Chassis 2504, now campaigning as '2509,' was repaired and used by the team until it the BRM P25 cars were ready. It was then leased to Horace Gould and was then sold to Bruce Halford. As 2509, it was rebodied prior to the 1957 season. In 1958, the chassis - apparently as 2504 - was rebodied with 'Piccolo' bodywork. It was later returned to Italy and then sold to a client in New Zealand. 2510 (2038) – This chassis number was not used on a 250/F1 chassis, only for the converted A6GCM chassis, 2038. 2511 (2502, 2506, 2519) – A 1954 works car, 2511 is chassis 2502 renumbered and delivered in August. After being campaigned by the works, it was sold to Scuderia Centro Sud in 1955 and driven by a variety of drivers. In late 1958/ early 1959, 2506 - incorporating parts from 2519 as well - was used to create a 'new' 2511 for Scuderia Centro Sud. 2512 (2518, 2520) – A 1954 works car which was introduced at the Nürburgring in late July for Marimón. This was the first 250F with the riveted rear fuel tank. Marimón was driving 2512 at the time he crashed and was killed. Sergio Mantovani was driving 2512 when he crashed at Turin, suffering massive leg injuries and effectively ending his career when one leg was amputated. It dropped from sight in mid-1955 and was re-numbered as '2518'. This was the streamliner (monoposto aerodinamica) used at Monza and Siracusa. In the Summer of 1956, the chassis was damaged by a fire and subsequently scrapped by the factory. The streamliner bodywork was discarded by the works and not retained. 2513 – A 1954 chassis completed by the factory but sold to Vandervell Products Ltd, G.A. Vandervell, as a rolling chassis, less engine and bodywork. 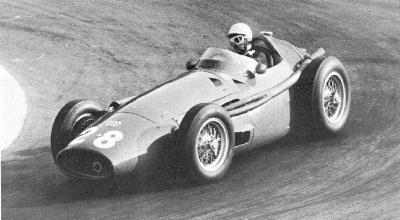 It was used by Vanwall as it developed its own cars in the 1955/1956 timeframe. It was never raced by the Vandervell team. Later, chassis 2508 was re-numbered as ‘2513’ when it was sold to Ross Jensen in New Zealand. 2514 – A 1954 works car which appeared with the newly standard riveted tail tank, versus the welded tank. Chassis 2514 was retained by the factory in 1955 for the works team. At the end of the season it was sold to Horace Gould. 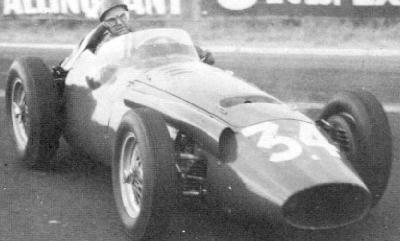 Gould raced 2514 during the 1956/1957/1958 seasons. 2514 was rebodied in 1958. 2515 – A 1955 works car delivered with the new bodywork lacking the louvres. It was the intended replacement for the earlier Roberto Mieres chassis, 2501/2046. In 1956 it was sold to Scuderia Guastalla and driven by Gerino Gerini. 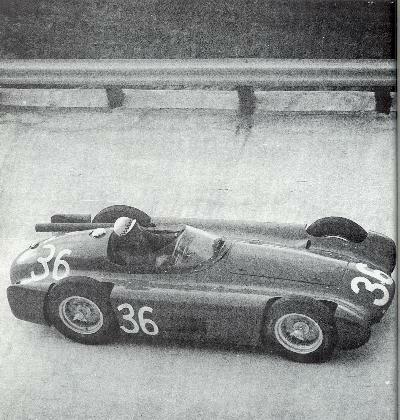 In 1957, chassis 2515 was obtained by Ottorino Volonterio. 2525 was rebodied during the 1957 season. It was maintained by the factory although campaigned infrequently. 2516 (2522) – This was a 1955 works car. It was delivered with the new louvreless bodywook similar to that of 2501. 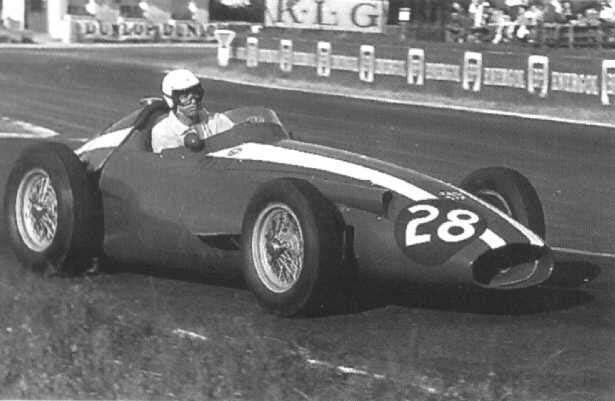 The chassis number 2516 was used for chassis 2522 for the 1956 entries in Argentine races for Moss. It was sold to Reg Hunt of Australia in 1956 and raced there for many years. 2517 – This one is easy! This chassis number was not issued, '17' being the Modenese equivalent of '13' and definitely considered unlucky by Italian gaming types in general. 2518 (2512) – A works car originally delivered in September 1955, designed to be a streamliner, monoposto aerodinamica. It was badly damaged in a fire in the Summer of 1956, after the race at Reims, at the works and then stored. 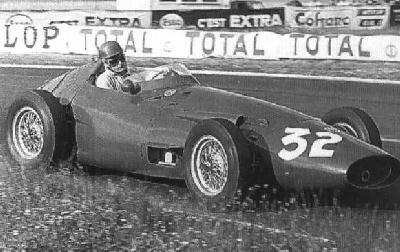 The 250F with chassis number 2518 was actually 2512 rebodied. This chassis number, 2518, was also used for the entries for Behra in the 1956 Argentine series. Why? Who knows? 2519 (2511) – This was a 1955 customer car delivered in August for Luigi Piotti. It was later campaigned by Gerino Gerini in conjunction with Scuderia Centro Sud. 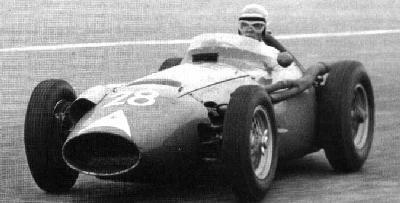 2519 was rebodied in late 1956 and again prior to the 1958 Italian Grand Prix. Parts from chassis 2519 were used during the construction of 2511 from 2506 by Scuderia Centro Sud in 1959. Those parts not used were last seen in the factory in the 1959/1960 timeframe. The assumption is that it was scrapped, but it may have been sold - no one is really certain on this one. 2520 (2512) – A 1956 factory works car, it was only used in the 1956 Argentine series, where it was entered as 2516. Why? Because that what Maserati obviously wanted to do… It featured new bodywork based on the 2501 pattern, but slightly cleaner looking. 2520 was then sold to Stan Jones of Australia in March of 1956 where it remained until returned to Europe in 1963. 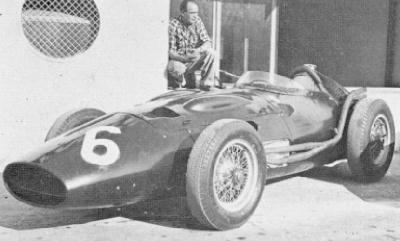 2521 (2518) – Another new works car for the 1956 season, delivered in time for the 1956 Argentine races, but for some reason entered as 2518. The chassis was later used by Bruce Halford, then sold to American John du Puy. 2521 was rebodied for the 1958/1959 seasons. It was raced by Jean Lucas and André Testut. It was then sold to Serge Pozzoli. 2522 (2507, 2516, 2523, 2526) – A works car delivered officially in March 1956, but which actually made its debut in Argentina as '2516'. Originally it was thought that 2522 was only rebodied at the end of the 1956 season. It was rebodied and renumbered as 2523 in August 1956. 2522-2523 was used as muletto for the development of the V-12. Sold to Scuderia Centro Sud in 1957. For 1958, the V-12 was replaced by a 6-cylinder 250F unit and renumbered as 2526. Chassis 2522, in the guise of chassis 2526 is then sold to Keith Campbell. Stored after death in Italy. Using the old chassis of 2507 which had been retained by the works, a 'new' chassis is built-up and numbered as '2523'. And then this chassis, '2507/2523' is then renumbered as '2522' by Scuderia Centro Sud when the 'real' 2522 becomes '2523'. With me so far? This chassis is then obtained by Temple Buell. 2523 (2507, 2522, 2501) – There were three 250F chassis that used the number '2523'. Let's try to approach them in some order. First will be '2523/1' since it is first with the chassis number 2523 assigned to it by the factory. In 1956, '2523/1' was built up using the frame originally from 2507, the chassis number '2507' having been re-assigned to the new chassis when it was returned to the customer. The damaged frame was repaired and returned to service and assigned the new chassis number 2523. In August of 1956, a new chassis bearing the number 2523 was completed. Therefore, the engine and other running gear were removed and the rolling chassis placed off to the side in the factory shops until some determination could be made as to what to do with the chassis. When a muletto was needed to test the V-12, 2523 was dusted off and the V-12 installed. After the need for testing the V-12 was completed, 2523 was once again rolled off to one side. Originally thought to sold 2501 as 2526, what Keith Campbell actually bought was 2522 after its being used as 2523, with new bodywork similar to that of 2501. In 1958, the chassis was completely refurbished, a 250/F1 engine installed and the car sold to Maria-Teresa di Filippis for the 1958 racing season. 2524 – A customer car delivered in May 1956 for Francisco ('Paco') Godia-Sales. 2524 was rebodied in mid-1957. It was obtained by Joakim Bonnier for the 1958 season. 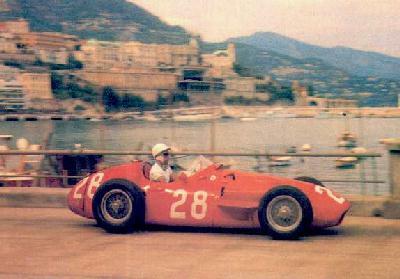 2525 – One of a pair of special works cars built-up for the 1956 Italian GP in September. The engine was installed angled slightly, fuoricentro, off to the left to allow a lower seating position. The car also featured new bodywork and a revised fuel tank. It was only raced once by the factory, at Monza. 2526 (2522, 2523, 2530) – The other factory special built exclusively for the 1956 race at Monza. It had the angled engine (fuoricentro), lowered seating position, revised bodywork and fuel tank. It was only raced by the factory twice and then retained by the works team until 1958. In 1958, it was re-numbered as 2530 and sold to Antonio Creus since '2526' had already been applied to 2522 or 2523/1 when it was sold to Keith Campbell. It was initially thought that Campbell had been sold 2501, but that was due in part to the new bodywork which was very similar to that of 2501. 2527 – One of the 1957 works 'Tipo 2' cars, 2527 was completed in December 1956. The chassis for the 1957 season were built on a pattern similar to the earlier cars, but with smaller gauge tubing. They were often referred to as the 'Lightweight' cars. The bodywork and fuel tank were similar to that of 2525 and 2526. Chassis 2527 was sold in 1958 to Australian Ken Kavanagh, the works Moto-Guzzi rider. 2528 – This chassis was the second of the 1957 works 'Tipo 2'/ 'lightweight' cars. Chassis 2528 was delivered in December 1956. This had a shorter, 2240mm, wheelbase than the usual 2280mm, and was preferred by Behra. In 1958 it was sold to Francisco 'Paco' Godia-Sales. It was obtained by Chimeri in Venezuela, but returned to Itlay sometime during 1960. 2529 – The third and last of the 1957 works 'Tipo 2'/ 'lightweight' cars, 2529 was delivered in late 1956. One of the famous of all the 250F series, it was the chassis used during Fangio's epic drive at the Nürburgring against Hawthorn and Collins in 1957. It was then sold in 1958 to Giorgio Scarlatti. Scarlatti then, in turn, sold it to Joakim Bonnier. In 1959, 2529 went to the Camoradi USA team and retained in the US. Originally thought to be the Bob Drake car used at the 1960 US GP. 2530 (2526) – This was a V-12 chassis built specifically for that purpose and delivered in 1957. However, 2530 was fitted with a 6-cylinder engine in 1958.The bodywork of 2530 was similar to the works cars that season with the only differences being those necessitated by the V-12. As noted, after testing the V-12, then being fitted was a normal 250F engine, it was taken back to the factory and not seen again until Argentina 1960. Chassis 2526 was renumbered 2530 when sold to Creus, which makes for some serious headaches since supposedly there were two chassis numbered 2530 on the grid at Buenos Aires. Again, no one said any of this had to make sense or follow any semblence of logic. 2531 – Another 1957 purpose-built 'Tipo 2' V-12 car delivered in Septenber of that year. 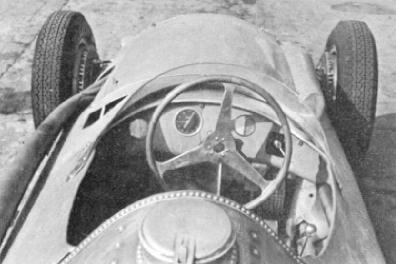 Chassis 2531 also used an engine offset at an angle to the driveshaft (fuoricentro) to the left allowing the seating position to be lowered. It appeared during practice at Reims and Pescara, but did not race until Monza. It was raced by Jean Behra, but the engine overheated and finally let go, so the car was retired. Although it appeared briefly at practice at both Modena and Casablanca, it was not raced again by the works. Sold, less the V-12 engine to a client in Brasil. 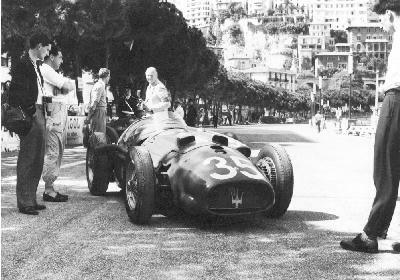 2532 – With the closing of the racing department at the end of the 1957 season, it appeared that there would be no more 250/F1's produced by the Officine Alfieri Maserati. However, in the Spring of 1958, chassis 2532 appeared. This was acually the first of the so-called 'Piccolo' cars. It was tested at the Nürburgring and appeared briefly in the paddock during practice for the race at Spa. 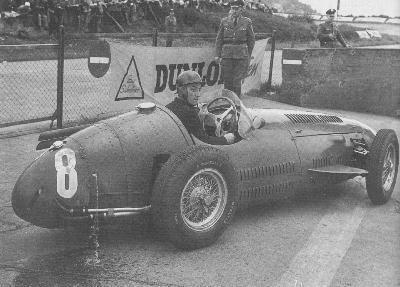 It then, apparently, went to Temple Buell after being used by Fangio at Reims for his last race. It was renumbered as 2533 by the Buell team. It was this chassis that appeared at the last race of the 2500cc formula, not 2529 as was thought. 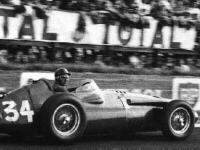 Therefore, Fangio drove cars that appeared in both the first - 2505 - and last - 2532 - races of the formula. 2533 – The first of the 'Tipo 3' cars built by the factory under the sponsorship of Temple Buell - as 2532. These cars are often called the 'Piccolo' cars. The cars were lighter, smaller, and had a shorter wheelbase than earlier versions of the 250/F. They were a rear guard reaction to the changes in the formula, particularly the shortened races distances. In common with some of the later cars, the driveshafts were angled slightly. 2534 – The second of the 'Tipo 3' or 'Piccolo' cars. This chassis was completed in September 1958, for Temple Buell. The team raced it as chassis 2533. Tec-Mec or ‘2535’ – The last of the series. It was started in the factory workshop, but completed by Valerio Colotti in his own shop, Officine Tecnica Meccanica, long after the factory racing team ceased operations at the end of the 1957 season. Although not officially assigned a 250F chassis number, the Tec-Mec would have been '2535.' It was only raced once, in the 1959 US GP.